Most Rev. 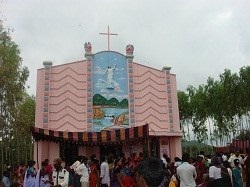 Marampudi Joji, the then Bishop of Khammam offered a permanent centre to the Congregation of the Mission including a plot of cultivable land at Yerruplaem, with the promise to make it an independent parish. In 1988, it was erected a Parish. Fr. Sunny Kuttikat was appointed as the first Parish Priest. Staying in a rented house Fr. Sunny and Dn. Thomas Enchackal were looking after the new parish and the construction of the presbytery in a separate plot purchased by the Congregation. In 1998, Yerrupalem was separated from the Kannapuram House and was erected a Canonical house. Fr. Sunny Kuttikat was appointed the first Superior. His Excellency Rt. Rev. Dr. Paul Maipan, Bishop of Khammam blessed the present presbytery on November 27, 1999. taking into consideration of the local situvation vincentian started an english mediam school in the year 2010.